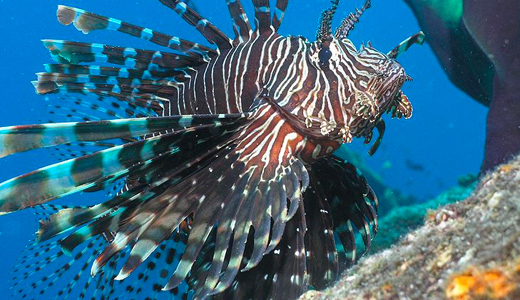 I work with Blue Ventures in Belize, where invasive lionfish present a major threat to coral reefs and fisheries. Our vision is to see thriving coastal communities supported by diverse marine ecosystems. We believe that growing markets for invasive lionfish provide a good, alternative livelihood opportunity to the 3,000 small scale fishers in Belize, while reducing the environmental impacts of this non-native predator, which has become firmly established on the Caribbean’s coral reefs. When I applied to the Kinship Fellows program, my natural science background was not enough to address the diverse challenges a career in conservation throws at you. At the time, Belize had recently sent its first export of lionfish to the United States and domestic demand, particularly from restaurants, was growing. I needed to properly understand what was influencing markets and human behavior in order to drive demand, increase removal rates, and ensure that the nascent market more adequately met fishers’ needs. Ultimately, I wanted to improve my ability to identify which strategies for lionfish management had the greatest potential for success, as well as prioritize those strategies with the broadest positive impacts across human and natural systems. The structure of the program was unique in that it allowed for Fellows and faculty to engage in lively discussions about different opinions or approaches, and to conduct an in-depth analysis of the day’s lessons in the context of a Fellow’s project. (Elinor) Ostrom was referenced daily, and these discussions have really helped me see how her eight principles for sustainable and fair common pool resource management can be applied to different realities. I gained a deeper appreciation for and understanding of the political economics of common pool resource governance. I was fascinated by the Working for Water program in South Africa and how its design was able to effectively meet social and environmental needs. It was extremely useful to learn how humanitarian organizations evaluate their impact—especially important to me as thriving coastal communities are at the center of our strategy. But without a doubt, the greatest lesson I learned from the Kinship Fellows program is how to recognize the difference between technical problems and adaptive challenges—the most effective response to each is often radically different. I take the lessons from Kinship to work with me every day. My notebook from the program sits on my desk for easy reference, and over the last two years I have used it countless times. The last time I picked it up was to refer to notes on business planning, and branding and communications, as I was reviewing strategic and business planning for the Belize Lionfish Jewelry group, which is currently in its first year of operation. This group of 19 women from seven coastal communities has established a non-profit membership organization that buys handmade lionfish jewelry from its members, performs quality control and resells in bulk; the annual profits are allocated to community initiatives voted on by members. This project is absolutely Kinship-inspired and the group’s activities deliver multiple and diverse benefits. Social wellbeing is improved in coastal communities through women’s economic empowerment, and the project is a new source of household income where economic opportunities are limited. Through commodification of previously discarded parts of the fish, the value of lionfish catch has increased to fishers, helping to overcome the real and perceived opportunity costs they face when targeting lionfish in place of traditionally-targeted species. At the Fellows program, we learned about the importance of adopting an integrated approach to enable long-term conservation-oriented behavior change. The jewelry helps to spread awareness of the lionfish invasion, and accelerates uptake of lionfish exploitation behavior through increased interpersonal communication.